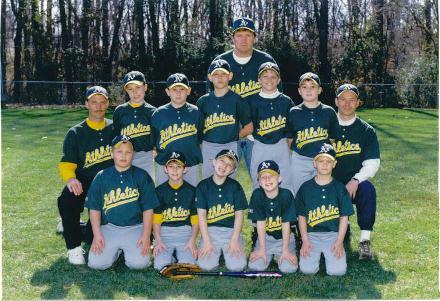 Left to Right, First Row: James Brittian, Austin Vaughn, Colby Gray, Allen Waites, and Matthew Drummond. Second Row: Coach Ragsdale, Hunter Ragsdale, Blake Bradbury, Curtis Leslie, Bull Crowder, Casey Carroll, and Coach Vaughn. The 2002 Minor League Gardendale Athletics won the regular season championship and the end of the season tournament championship. Gardendale is very proud of their coaches and players. There have been visitors since March 22, 2002.